The students’ reaction to the pronunciation workshop was positive and even enthusiastic. new approaches and techniques to share with you in the 2018 series of teacher training workshops. Details below. Hope to see you! Get pronunciation out of the head and into the body! The physicality of pronunciation. 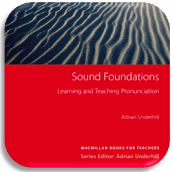 Learn to use proprioception and the pronunciation chart to boost your learners success with pronunciation and comfortable intelligibility.